KATHMANDU, April 17: Some international donors that had pledged billions of rupees for post-earthquake reconstruction in Nepal but are yet to provide the pledged amounts to the National Reconstruction Authority (NRA) did not attend a meeting summoned by NRA on Monday. After Finance Minister Yuba Raj Khatiwada pointed out last month that the government has not been able to mobilize the foreign assistance pledged for reconstruction and that the government needed to seek additional reconstruction funds , NRA summoned a meeting with donors on Monday. A major part of the meeting agenda was to urge the donors to release the pledged amounts that are yet to be released. But all donors who had pledged financial support and are yet to do so skipped the meeting . “We had sent invitations to all donors including those who had pledged to provide financial assistance for reconstruction but are yet to release the funds. But none of the latter showed up,” said Bhishma Kumar Bhusal, who leads the foreign aid coordination section at NRA. According to NRA officials, representatives of Australia, Austria, Bangladesh, the Netherlands, Norway, Pakistan, Saudi Arab, Sweden, Finland and Turkey did not attend the meeting . 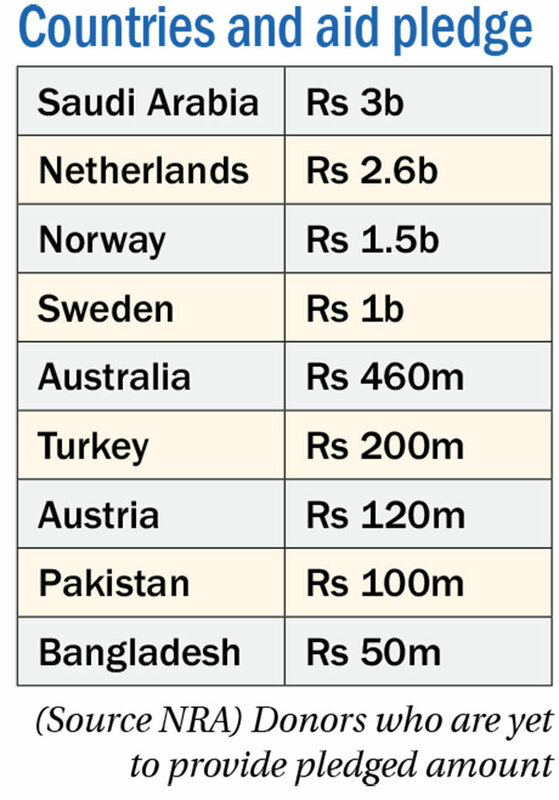 Saudi Arabia had pledged Rs 3 billion, the Netherlands had pledged Rs 2.6 billion; Norway Rs 1.5 billion; Sweden Rs 1 billion; Australia Rs 460 million; Turkey Rs 200 million; Austria 120 million, Pakistan Rs 100 million and Bangladesh Rs 50 million. “We have come to know that Australia and Finland have been carrying out reconstruction work on their own. They have not officially informed us of this so far,” Bhusal said. Altogether 25 donors had pledged a total of Rs 401 billion at the donor conference organized right after the 2015 earthquakes. But as the donors have stated that the money they spent on relief and rescue operations right after the earthquake was part of the pledged money, Nepal was to get Rs 343 billion . And of this 343 billion, NRA has signed agreements with donors for only Rs 262 billion. While agreements have been signed for only 75 percent of the pledged amount, only 16 percent of the agreed funds have been disbursed so far. This fact was also stressed by Finance Minister Khatiwada while presenting a white paper in parliament last month. Bangladesh had pledged Rs 50 million at the donor conference and Bangladeshi officials say they have already spent the aid on relief and rescue right after the earthquake, said one NRA official. At the meeting held with donors Monday, foreign aid coordination chief Bhusal urged all donors to release the pledged amounts in timely fashion. “All Nepalese are looking to effective mobilization of the Rs 401 billion pledged. I would like to request you all to ensure that the money is spent transparently, effectively and in line with the priorities of the reconstruction authority. Let us work closely to utilize the pledged money for result-oriented reconstruction efforts,” Bhusal said while addressing representatives of development partners present at the meeting.